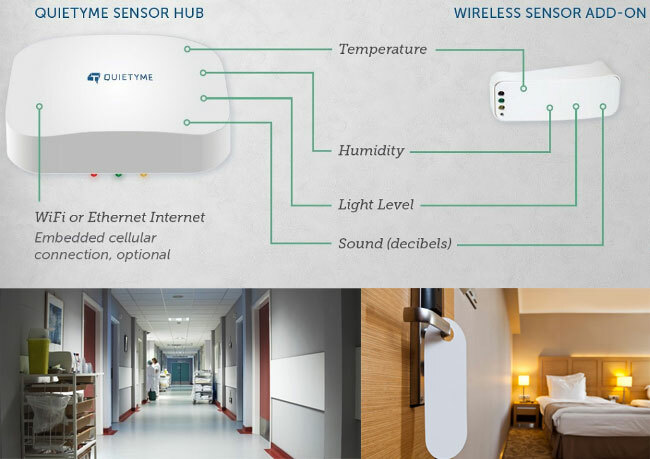 Quietyme is a network of noise sensors designed for hospitals, hotels, and other multi-occupancy buildings where it’s important for customer reviews, patient hospital satisfaction scores, and for general peace and quiet. Unlike most connected sensors, which use their data to trigger behavior in other devices, software and services, Quietyme puts the focus on changing the behavior of human residents. It takes readings constantly throughout the day, noting any spikes in noise levels and paying special attention to loud noises during hours when people are generally sleeping. Once it’s calibrated to a building’s “normal” pattern and some user-defined parameters, it can start to provide analytics to help residents and staff change patterns of behavior that cause noise disruptions at inappropriate times, and give instant feedback to help them respond to unexpected situations. To provide coverage throughout a building, the sensors are plugged into outlets in every room and hallway. They communicate via ZigBee with hubs that use Wi-Fi, ethernet, or a cellular data connection to send data to a cloud service. Building managers and staff can view the data and receive alerts through web and mobile apps, texts, email, or automated phone calls. The sensors measure decibels (loudness), but they don’t record specific sounds like words. They also measure temperature, light levels, and humidity, which makes them useful for early detection of problems with heating and cooling systems, flooding, leaks, mold and other infrastructure issues. The company plans to add other types of sensors in the future, which could expand Quietyme into more traditional areas of building automation. Learn more at Quietyme.com or in the video below.